Full set of control buttons for progressing PointPoint slides. To control advancing or backward of your slides is just a simple touches on your hands. You could focus on managing the audience attention and don’t need rely on your colleagues to advance the slides. Drawing board on top of PowerPoint slide. With ‘Pen’ function of iWritingPen, you can write anything on the screen on top of any PowerPoint slides to elaborate the points being discussed. You no longer need the other clumsy physical drawing board for drawing something during presentation. Your audiences will stay on the same screen during the whole presentation and their attentions will not be diverted. Whenever there is a need to have a longer period for discussion in the middle of presentation, the “Black” screen function turns the screen off (black color) and let you control the audience focus of the subject matters. To allow you to have full control your desktops even outside PowerPoint presentation. You can still perform a live demonstration on your desktop through full functional Keyboard Mouse of iWritingPen. You no longer need to come to your desktop again. You can continue the whole presentation and business demonstration on the same rundown smoothly with iWritingPen. To allow you to have quick typing during presentation, iWritingPen supports the native handwriting input of all languages available in iPad including Siri. iWritingPen is offered at FREE. Yes. That’s true. What are you waiting for? Please download and install it now immediately. Please Write us a GOOD review in App Store for such HIGH Quality App as rewards to us. We need your support and appreciation! iWritingPen requires to install iWritingPen client desktop program on your desktop. It could be downloaded from here. iPhone / iPad must be on the same network with iWritingPen desktop client. 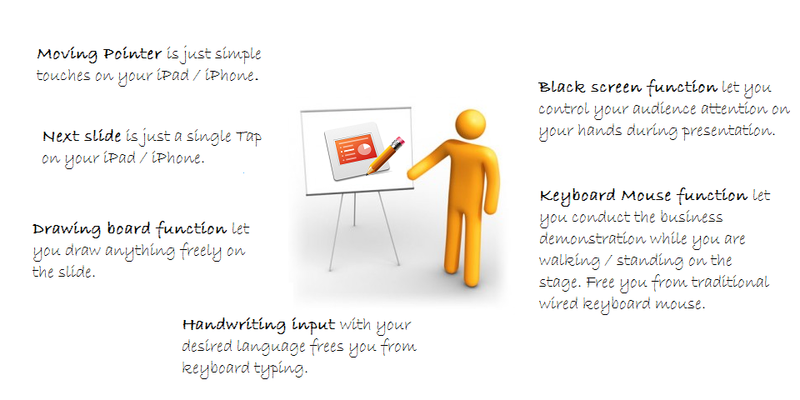 The smooth data communication between iWritingPen desktop and iPhone /iPad is required for iWritingPen to work efficiently. For those users with desktop Mac OS X 10.6 or later, it is highly recommended to use the bluetooth to connect to iPhone/iPad. The data traffic congestion in the local router can be avoided under local bluetooth connection. Microsoft PowerPoint 2003, or later. Supported Desktop Operating System – Microsoft Windows 8, Windows 7 and Vista. Apple Mac OS X 10.6 or later. We love to hear your question. Feel free share your suggestions at Facebook. To live chat with us now.